Hello new product from Aussie, how you doing there? Yes it's that new product everyone has been raving about - and I know I'm on a spending ban but this was free as part of a 3 for 2 at Boots .... so really it's okay right? Over the last month or so I have spotted lots of those bloggers who love beauty speaking about this stuff! So of course after reading their reviews I instantly wanted to hunt this product down and hop in the shower! This is a mousse that you pop on after shampooing and leave on your locks for 3 minutes before rinsing it out.... hence the name! 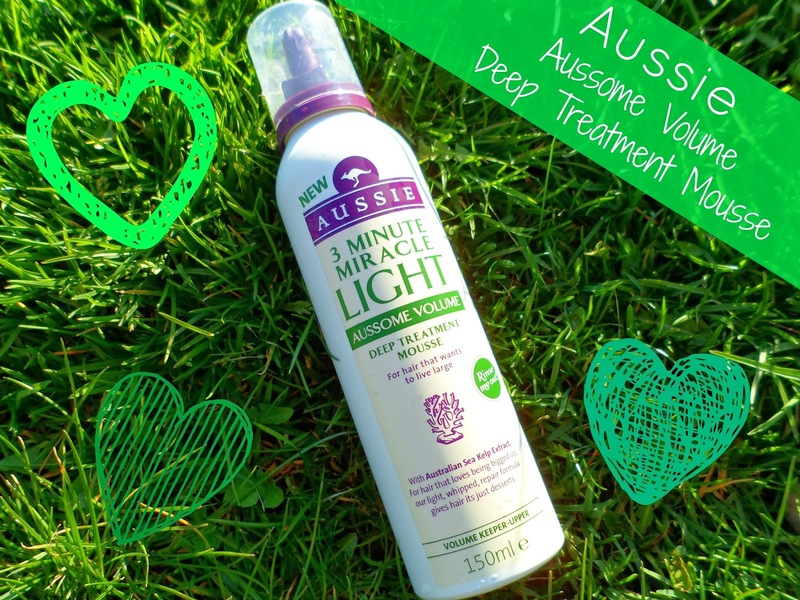 I was excited to try this out as I haven't used anything like this before - mousse is something I normally stay clear of when styling, I've just never seemed to get on with it so I was looking forward to trying it in a different form! The aim of the product is to give you more volume - something we are all striving for right? I've always been a fan of Aussie since I used to steal my mum's as a kid/teen - the smell is just divine.... why have they not made an Aussie candle yet? Saying that.... this smell is nice but it doesn't smell exactly like the usual shampoos and conditioners from Aussie which is what I was expecting... ahh well! Being a 'mousse' something I was worried about with this was the feel of the product. When I think of mousse I think of sticky but thankfully this stuff is anything but! Creamy and fluffy this stuff feels fab! I definitely feel like I used a fair bit on my hair - I started with a good handful but as soon as I ran it through my hair it felt like it had disappeared so I added a little bit more and a little bit more. It is a strange feeling for a conditioning treatment - I'm so used to feeling a thick and creamy mask type product on my hair when doing a treatment - but this felt like it dissolved and soaked right in! I didn't let this put me off thought and after the 3 minutes I washed it out and headed to my hair dryer to see the results! I could definitely see some volume improvement in my hair after I had given it a quick blow dry! Surprisingly I could really see it in the ends. My hair didn't seem to be it's normal 'thicker at the roots, thinner at the ends' self - the ends had alot more body which I was chuffed with! This stuff is a nice treat to have and even though I think I used alot when I shake the bottle it doesn't feel like alot has gone, so hopefully this will last me a while! At only £4.99 it's alot cheaper than other treatment type products and if you've got really fine, flat hair then maybe this is the product for you! Wanna follow? Just let me know! Great review, this product seems as though it is worth a try and it's such a bargain if it works well.